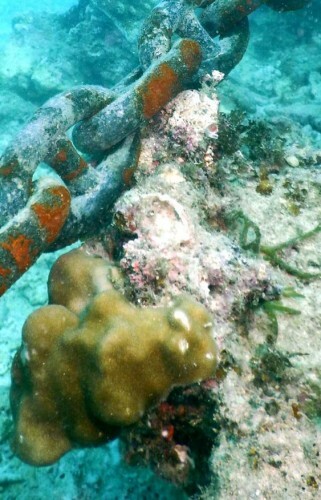 Coral damaged by chains and concrete blocks. In Oura Bay on July 16 (Photograph provided by the Diving Team Rainbow). The Japanese government is carrying out preparation work in Oura Bay for construction of a new U.S. base that would replace the Futenma air base in Ginowan. On July 16, members of Diving Team Rainbow of the Helicopter Base Objection Association confirmed newly damaged coral. They were investigating the impact of typhoon Chan-hom on the coral and seabed of Oura Bay. Chains and concrete blocks that were installed to support buoys marking out a restricted area, appeared to have damaged the corals. The members have confirmed damage traces and color changes, which they observed on coral, were caused by typhoon Chan-hom. In video footage taken on July 16, broken coral can be seen and the noise of construction chains damaging the coral can be heard. The team dived to depths as low as 10 meters and filmed around the buoys marking out the area.